Flying Skirts Tribal Belly Dance Costumes: Tribal Diva 4 piece Set! Tribal Diva 4 piece Set! save $40! and hit the stage looking like a Diva! The Choli! Black velvet In long sleeve or short sleeve . This gorgeous stage choli is made of stretch velvet with carefully placed darts and gussets to provide shape, support, and complete dance mobility. It is close fitting, with a flattering and cooling open back. 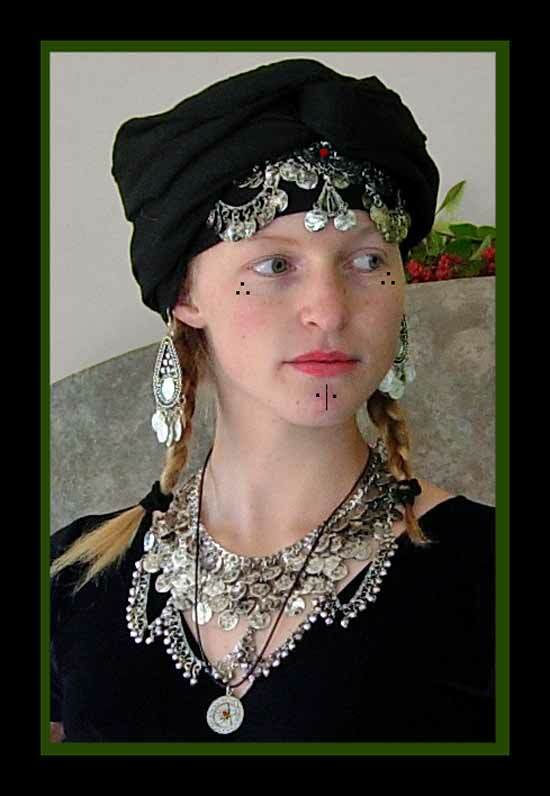 The Tribal Turban! Made from black light -weight tacky cotton with finished edges, it stays in place, absorbs sweat ,and holds up to repeated pinning and adorning . Measures 45"X 90"; the perfect size to wear alone or to act as the base for an elaborate performance turban. The turban base comes with easy to follow illustrated wrapping instructions and this advice: Give yourself time and Have Fun! 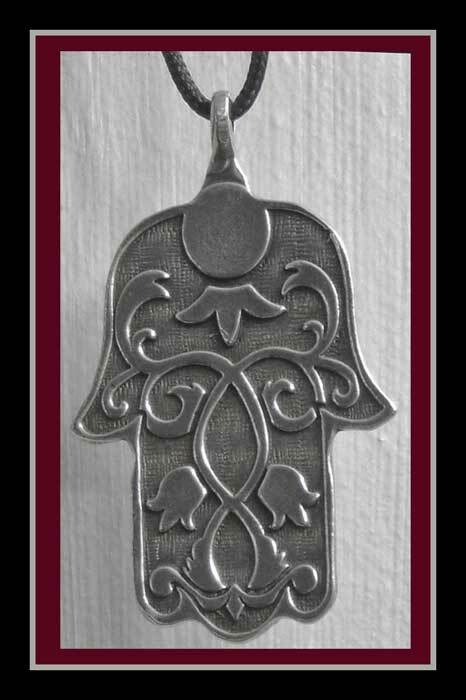 The Pewter Pendent! The Hand of Fatima universal symbol of Protection and Blessing and a Tribal favorite, hangs gracefully from a waxed black cord, cleverly hand-knotted (by Gwen) to be adjustable, so it can be worn at the hollow of the throat or at the sweet spot at the top of the breast bone, a lovely reminder to lift and stabilize for effortless upper body isolations. The Skirt! Black Cotton. Wonderful for skirt work! Four tiers, 15 yards at the hem. Made from light weight, easy care cotton.